The new telescopic arm excavator from Hitachi is the optimum solution for complex below-ground construction projects. As the smallest model in the range, the ZX210LC-6 is ideal for working in confined spaces. Capable of excavating to depths of 21 metres, it offers high levels of productivity, a powerful performance and exceptional versatility. The new special application model will be presented at Intermat by Payen, an authorised dealer of Hitachi Construction Machinery Sales and Service France SAS. The machine has been developed by Hitachi to meet the challenging requirements of underground projects in Europe. 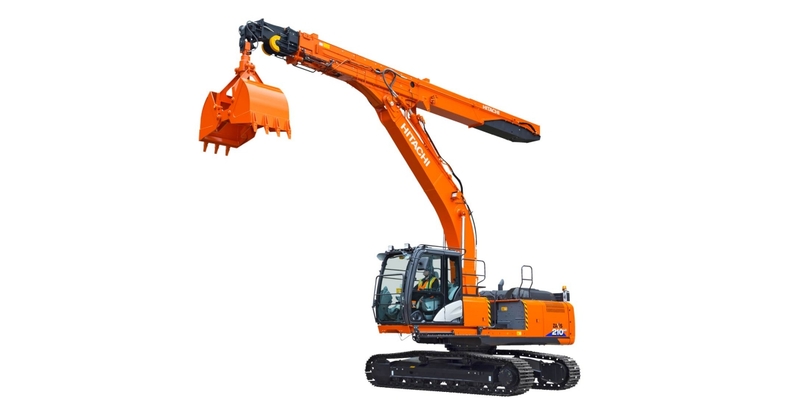 The telescopic arm of the ZX210LC-6 extends and retracts smoothly in seconds using a technologically advanced combination of rope and hydraulic cylinders. This enables it to remove soil quickly and easily from a maximum depth of 21 metres and load trucks efficiently so the material can be transported off site. It is not only more efficient than traditional methods, such as using cranes, skips and conveyor belts, but it is also safer and more cost-effective. Due to its compact size, quiet operation and exceptional visibility, it is ideal for working on busy, urban job sites. Visibility is enhanced by the sliding cab, which is positioned 960mm further forward than on a standard model and can move an additional 1,300mm forward to provide the operator with an excellent view of the ground below. The large window in the floor of the cab also enables the operator to work safely and precisely, ensuring a high level of performance. Optional adjustable LED working lights can be positioned at the front of the cab to illuminate the area below ground, and ensure a safe and comfortable operation. Further examples of the enhanced safety of the ZX210LC-6 are the warning lights and alarms in the cab. In the unlikely event that the two ropes were to break suddenly or extend too far, an indication light would alert the operator immediately. Should too much pressure be applied once the clamshell bucket has reached the ground, a warning buzzer sounds to inform the operator. In addition, the telescopic arm is equipped with a hose rupture valve, which in the unlikely event of a damaged cylinder, would prevent any further impact on the machine or the environment. For enhanced versatility, the ZX210LC-6 telescopic arm excavator is also available with an optional standard arm and additional counterweight. This makes it easily adjustable for light excavation tasks if required.